Excuse the shameless self-promotion, but I really have to let you guys in on this. For the past three and a half years, I've been working on the book you see at your right. If you receive FC&G via email, the launch date of this book is today. I fell in love with Key West on our honeymoon. As so many do, I got off our cruise ship and walked with my new husband down Duval Street, but it wasn't the bars and the shopping that first drew my eye; I thought that was a little overwhelming. Instead, my new husband decided we should cross over to one of the historic streets paralleling Duval, and it was then that the love affair began. I looked at all the old Conch and Victorian houses and felt that I could hear the echoes of the history of this island. Meanwhile, through my college teaching, I was developing a specialty in the history of advertising, and I began to explore the advertising that brought people to the island. Along the way, I discovered that Key West has not always been a tourist town. Instead, it once was a thriving business hub, and the advertising reflected that. It was only with the onset of the Great Depression that things changed, and tourism became the island's primary industry. As I wrote this book, I imagined who might read it. Of course, I want historians, advertisers, graphic designers, and those in the travel/tourism industry to read this. 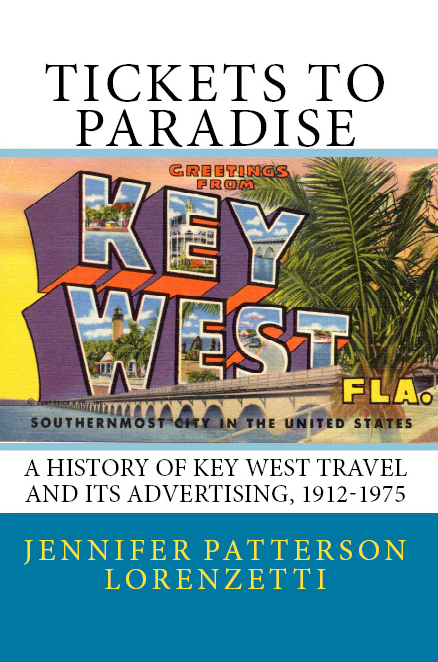 However, I also hope that tourists contemplating or in the middle of a visit to Key West grab a copy and learn more about their vacation destination. If you are interested in this book, the Amazon/Kindle link is below. There is also a link to buy directly from me; for a limited time, the book is 20% off list price with free shipping to celebrate the launch.